Mukesh Ambani, Chairman and Managing Director, Reliance Industries has said that he plans to further invest Rs 10,000 crore in the digital space of the state. 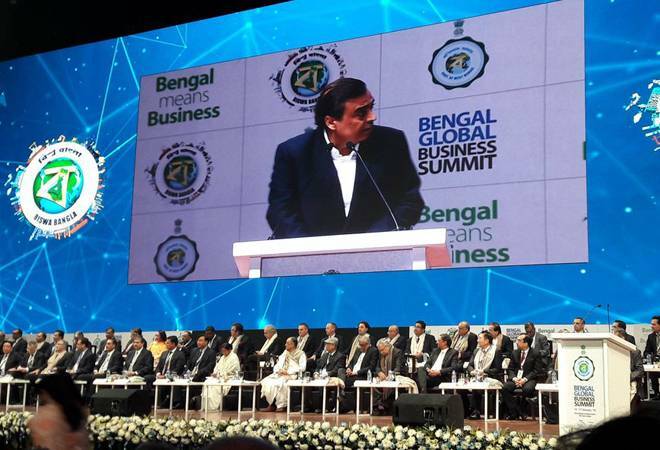 Speaking at the fifth edition of The Bengal Global Business Summit 2019, Ambani said that they are the biggest investor in the digital space of West Bengal with Rs 28,000 crore so far. The company’s investments in the state already account for one-tenth of the total investments in the country so far, he added. The plan to invest Rs 10,000 crore more is already under implementation. He added that in 2016 when he first attended the summit, Reliance’s investment in the state was to the tune of Rs 4,500 crore. Ambani spoke about Reliance Industries’ role in the development of West Bengal. The Reliance Industries Chairman said that their aim to cover 100% of the state’s population with the Jio network is “progressing at a fast pace” and that they aim to meet their goal within 2019. He also said that they plan to transform every home in West Bengal into a smart home and that Jio’s Gigafiber project to this end “has progressed well”. Mukesh Ambani also brought up Reliance Retail and said that the company operates 500 stores and 46 Petro Retail Outlets across 400 cities and towns of the state. He added, “West Bengal is poised to become the logistics hub of the East with plans to attract investments of Rs 5,000 crore by 2020. This can create direct and indirect jobs for 50,000 people. “Jio and Reliance Retail will shortly launch a unique New Commerce platform, which will bring win-win benefits to consumers, retailers and producers. Across the country, this platform will enrich and empower as many as 3 crore small shopkeepers,” said Mukesh Ambani. Ambani mentioned that they have also set up Jio Points, which are direct distribution channels that will cater to the growing rural market. There are already 350 Jio Points in Bengal, which the company is targeting to increase to 1,000 by the end of the year. He then thanked the state government for allotting land for their Data Centre project in Kolkata. “I assure you that we will implement this project speedily and make it as good as the ones in Silicon Valley,” Ambani added. Ambani took the stage to congratulate CM Mamata Banerjee for transforming West Bengal into “Best Bengal”. “Bengal’s GDP has crossed Rs 10 lakh crore. It was less than Rs 4 lakh crore at the beginning of this decade, when you took reins of this state in your able hands,” he added.